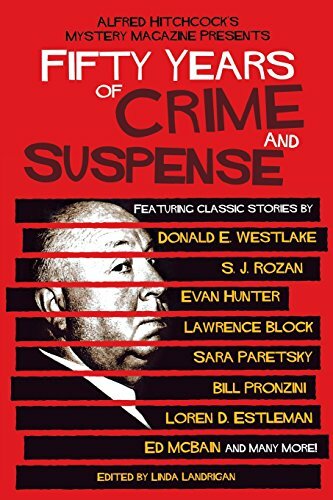 Alfred Hitchcock’s Mystery Magazine Presents Fifty Years of Crime and Suspense is not an anthology of the best crime stories of the past 50 years, the best that were published in AHMM. Yet one can certainly make a case that since AHMM is one of the few outlets devoted to crime short stories, it’s a good lens with which to view their history and to reflect back to readers how society has changed. Alfred Hitchcock’s Mystery Magazine Presents Fifty Years of Crime and Suspense is set up chronologically, and the rapid pace of a changing society is blindingly apparent in its selection of stories. The first selections cover the tough, lonely PIs, whereas much later ones include such current social issues as homelessness. The first story from 1957 is by Jim Thompson, known as the father of noir, but perhaps best known for his novel The Killer Inside Me. Here he introduces the grafter Mitch Allison, who loses, then wins, then loses again the thing that makes his life worth living: money. In January 1984 in the magazine and 200 pages into this collection, the first woman shows up, author Sara Paretsky. Her story, “The Takamoku Joseki,” is solved without private investigator V. I. Warshawski leaving her apartment building. It’s not all car chases, punks, and shots of whiskey for the modern P. I.—sometimes it’s dull reality. Only 18% of the stories are by women, and given the early prevalence of male writers that makes sense. But things have changed—a lot—in the past 20 years, and perhaps more stories by women might more accurately reflect the presence of female crime writers. There are a goodly number of stories with twist endings that leave the reader reeling, such as the unexpected one found in “The Method Sheriff” by Ed Lacy. It all seems like a normal bank robbery until it becomes clear how small a small town can be. Donald E. Westlake’s “Good Night! Good Night!” is about a murder victim’s search for his killer—while he’s dying. But this story, published in 1960, reflects the ruthless atmosphere backstage at a live television show, and somehow makes the flickering television itself appear sinister. And S. J. Rozan, who seems unable to write an uninteresting page, provides us with “Body English,” introducing her two standout characters, Lydia Chin and Bill Smith. They have gone on to to be featured in novels, but the clash of cultures—Asian and non-Asian—has Lydia juggling her mother’s generation of Chinese in New York City’s Chinatown with the rest of her Manhattan life; having a non-Chinese boyfriend doesn’t help. The locked room drama of “A Long Way Down” by Edward D. Hoch is proof of how a master handles the format. How does a guy jump out the window of a smooth glass office building and not be found on the ground? The countdown story—7:00 A.M. shut off alarm, 7:15 ate breakfast etc.—is another shopworn format, but in “Erie’s Last Day” by Steve Hockensmith, it leads to a satisfying conclusion: Erie is retiring as a homicide detective, and he wants to catch a killer on his last day on the job. Wait until you find out why.